Posted on April 5, 2017 under in Photos | By admin. 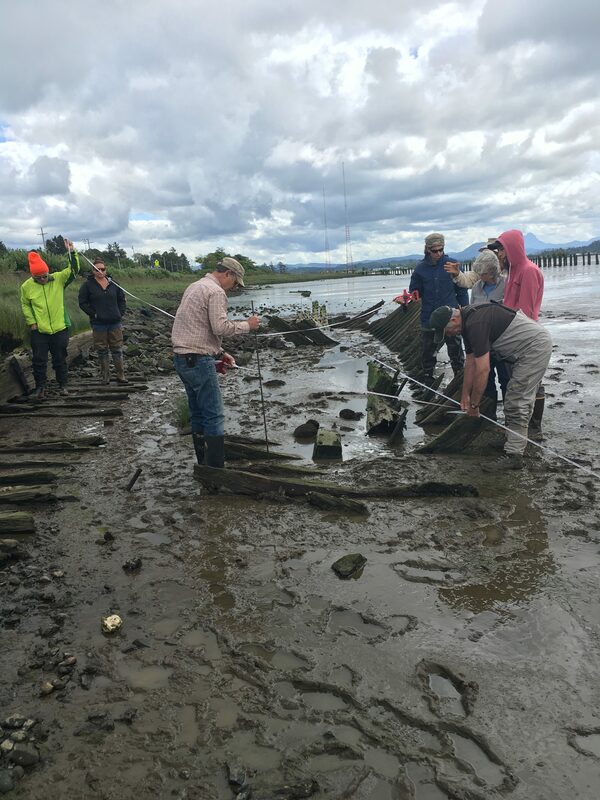 At the request of the National Park Service, volunteers from MAS surveyed the remains of a small boat in Lewis and Clark National Historical Park. It was very slick and muddy, but our intrepid team was able to successfully record the site. Visitors to Lewis and Clark National Historical Park often ask rangers about a boat stuck in the mud along the Netul River trail. At low tide, the wooden boat frame is highly visible from the bridge crossing the mouth of Colewort Creek, where it meets the Lewis and Clark River (called the Netul by the Clatsop people and the Lewis and Clark Expedition). Unfortunately, the park had no information about the boat to share with park visitors. 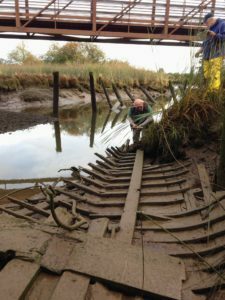 Through our recent collaboration, the National Park Service has learned about the boat and can improve site interpretation and resource management while MAS volunteers practiced techniques for recording and researching historic vessels. Scaled drawings were produced and compared with vessels at the Columbia River Maritime Museum to identify the type of boat, its use, and its likely age. The drawing most closely resembled the gillnet fishing boats that were built during the 1920s and 1930s. Based on the position of the engine mountings, the team estimated that the boat had a square stern. Posted on April 3, 2017 under in Photos | By admin. Over a dozen trained MAS volunteers helped survey the late 19th century side-wheeler steamboat in Astoria in the Spring of 2016. Built by Port Captain J.W. Troup of the Oregon Railway & Navigation Company, T.J. Potter was considered the fastest sidewheel steamer in the Pacific NW for its time, reportedly reaching speeds of fifty miles per hour on the Columbia River and weighing 1017 gross tons after a 1901 rebuild (230 feet long, 35 foot beam, and 10 foot 4 inch depth of hold; 32 inch x 96 inch engines). By 1916, the ship was condemned for passenger use and used by construction teams as a barrack’s boat until around 1920, when she met her fate in Youngs Bay and was burned down, her metal parts salvaged. Posted on July 26, 2016 under in Photos | By admin. Here’s a quick video of the highlights of our first ROV field test in the Columbia River. Silvia de Grasse was a lumber schooner that sank in Astoria in 1849. We didn’t find the hull, but our primary goal was to test the ROV outside the pool, and that was a big success. Great job MAS ROV team! We know the fate of Sylvia de Grasse was her being stranding on a rocky ledge in the Columbia River in November of 1849. The ship was over loaded with lumber acquired in the ports upriver and bound for San Francisco. Captain William Gray tried unsuccessfully to offload the lumber and re-float the ship. The ships remains can still be found at the base of that rocky ledge. 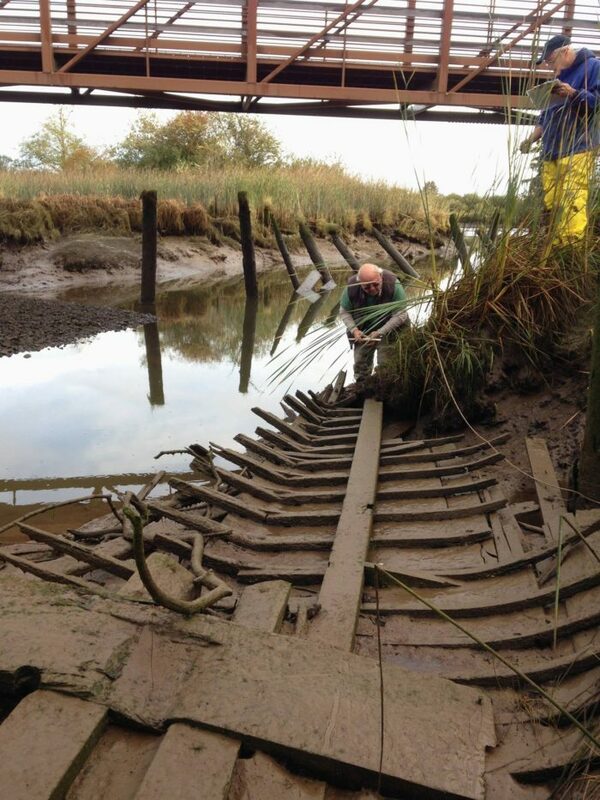 In 1895 her timbers could still be seen at low tide. Sylvia de Grasse most likely started her career in 1822 with Francis Depaw’s founding of the line of Havre packets with six ships. A packet line refers to a regularly scheduled service carrying freight, passengers and mail between ports. Sylvia de Grasse sailed as a packet ship between New York and La Havre France from 1822 to 1848. The Packet line Sylvia de Grasse sailed with changed names several times between 1822 and 1849. By 1849, Sylvia de Grasse sailed for the Union Line of Havre Packets. In 1849, Union Line of Havre Packets chartered Sylvia de Grasse and Rhone to the US Government to transport troops from the New York to San Francisco. Sylvia de Grasse arrived in San Francisco April 18th 148 days out of New York. Records indicate the master of Sylvia de Grasse when she arrived in San Francisco was named Rider. We do not yet know if this is a clerical error or if the ship was sold to Gray in San Francisco. Gray was clearly by many sources the master of Sylvia de Grasse in her time on the Columbia River. We still have other holes in our knowledge of Sylvia de Grasse’s history. We do not know when the ship was built. The first we find her in history is in 1822. Was Gray one of Union Line’s captains or did he purchase the ship in San Francisco? There is also information that the medicine chest from the Sylvia de Grasse was still around in the 1880’s. Where did the chest go and does it still exist? Posted on December 14, 2015 under in Photos | By admin.